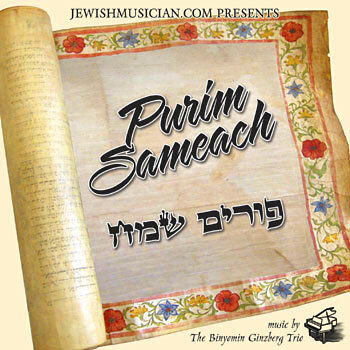 A jewishmusician.com production, Purim Sameach gathers together Purim tunes from around the world, from Chassidic nigunim to traditional Israeli songs, and from Klezmer melodies to contemporary Jewish folk rock. The tracks feature The Binyomin Ginzberg Trio in both woodwind and guitar trio formats, as well as one track with a guest fiddle player, and one track featuring a collaboration between members of the guitar and woodwind trios. Jewishmusician.com provides both music production services and live musical entertainment for wedding receptions, Bar/Bat Mitzvahs, and other private functions, serving the New York tri-state area and beyond. 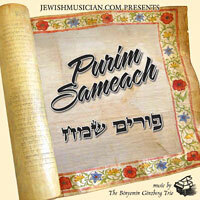 Our featured bands include the jewishmusician.com Simcha Ensemble and The Binyomin Ginzberg Trio. Led by Binyomin Ginzberg on keyboard and vocals, the Trio has been performing since 1998. The group’s unique and imaginative mélange of Klezmer, Chassidic, Jazz, and contemporary influences make for a sophisticated blend of spirited and soulful music that is perfect for dancing and listening. The Binyomin Ginzberg Trio is available for performances in various configurations, most often featuring keyboard, drums, and either woodwinds or guitar. Jewishmusician.com can also provide a full-size Simcha Ensemble for occasions when a larger band is desired. Additional options include guest vocalists, featured soloists, violinists or a string quartet. The Trio is available for concerts and public performances featuring the group’s unique musical arrangements of traditional and contemporary Jewish music from around the world. For more information about jewishmusician.com and The Binyomin Ginzberg Trio, please contact us at (201) 385-3477 or email us at info@jewishmusician.com.